Clifton Street is one of several roads in Sutton to have been obliterated by redevelopment; for example, the Gracechurch Centre now stands on what used to be Avenue Road, and Newhall Street is somewhere underneath Newhall Walk. Clifton Street ran next to the Three Tuns from High Street to the top of the Reddicroft, parallel to Railway Road and King Edward Square. In 1800 neither Railway Road nor King Edward Square existed, and Clifton Street was the only side road off High Street. The early history of High Street is obscure. In his recent book, The Archaeology of Sutton Park”, Mike Hodder suggests that the original Sutton Park of c.1110 extended as far east as High Street and Lichfield Road. Another theory is that the manorial lord replanned the town early in the twelfth century, laying out burgage plots along High Street. Houses were built on the burgage plots, each plot with a frontage of fifteen to twenty yards and a large garden at the rear, and occupied by the wealthier inhabitants. A driveway between two plots, later known as Clifton Street, gave access to the fields beyond. Clifton Street probably derives its name from Thomas Clifton, who came to live in Sutton in 1646, setting up his trade as a dyer and shearman in a house in High Street which now forms part of the Three Tuns Hotel. He extended the house, and his sons continued to build at the back, so it was already a large property when it was converted into the present Three Tuns in the eighteenth century. Stables were built at the rear, facing into the courtyard, so that most of the left-hand side of Clifton Street was bounded by a blank wall. 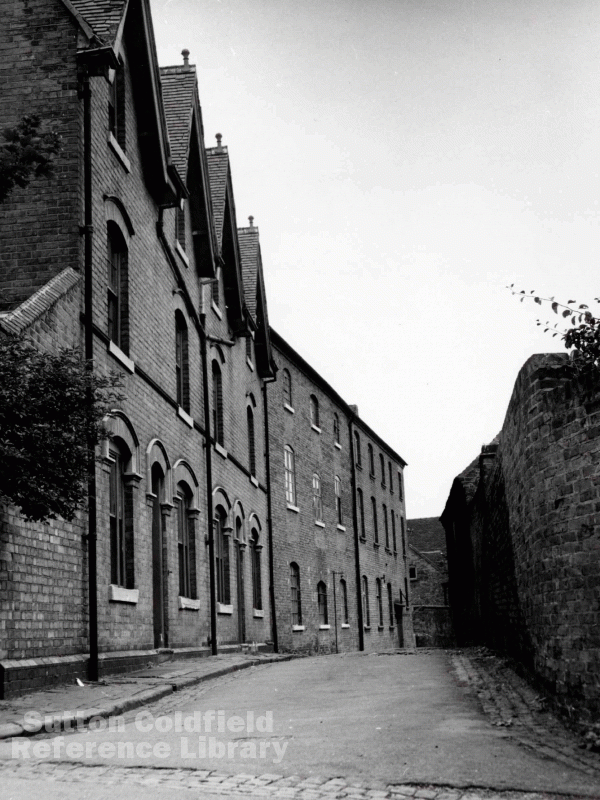 In 1860 James Hughes still owned the whole plot, but three cottages along Clifton Street and parts of the yard were let to tenants - the Groutage family, employed at the Powells Pool Spade mill, and James Eastwood, ostler at the Three Tuns, and his family. Holbeche referred to Clifton Street as “Cottons Entry where old George Eastwood lived, he had rickety legs, and his son also, just beyond was Hughes’ wool warehouse”. In 1900 the Royal Sutton Laundry occupied the old wool warehouse; by 1960 the area was very run down and acquired by developers. All the buildings on either side of the Three Tuns were demolished in 1972 and the present offices were built by 1980, and Clifton Street was no more. Clifton Street from King Edward Square, c.1920. On the right is the wall of the Three Tuns property, on the left, beyond the two Edwardian houses, is the former wool warehouse. (Photograph courtesy of Sutton Reference Library). 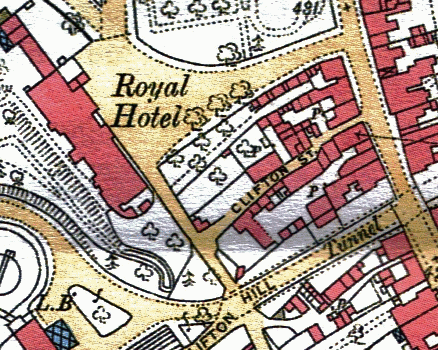 Detail from an Ordnance Survey map of 1886; High Street is on the right, the Council House was then a hotel, and Railway Road was Clifton Hill. The outbuildings of the Three Tuns extend along the south side of Clifton Street; on the north side, above the word Clifton, is the old wool warehouse.